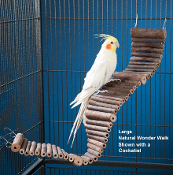 Dragonwood Double Bolt Perch - 24"
Home > Perches > Dragonwood Double Bolt Perch - 24"
Natural dragonwood perch measures 24" long and is 1.5-2" in diameter. Suitable for large and extra-large birds. **Please note that if we are shipping this item to you, the shipping cost will be more than quoted on the check-out. This is due to the items large size and substantial weight. Please inquire in advance for further details. Zig Zag Cotton Rope Perch - Large 1"d x 61"
Poplar Platform Squiggle Perch - 5-1/2" x 1"
Java Perch - Y-Branch - Small - 9"